Whenever Mike and I drive to our hometown, we bust out some version of Madonna’s “This Used To Be My Playground”. Sometimes it’s “this used to be my Riiiiita’s” (my first job scooping Italian Ice) or “This used to be my Targeeet”. Have no clue what I’m talking about? Well there’s an official Madonna YouTube channel! Why am I rambling about Madonna songs? Well this weekend we took a trip to my parents’ house (who live about an hour away now). They are remodeling their kitchen and I wanted to take before pictures. Remember how I always say that I want old house to remodel because of the awesome before/after pictures? Well, of course I jumped on the opportunity to cover this on the blog! 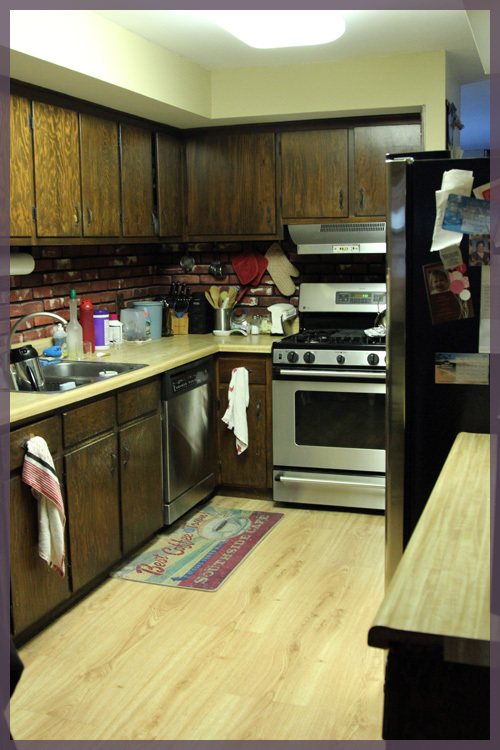 Plus this isn’t just any remodel, this is the remodel of my childhood kitchen. The one that has remained untouched since we moved in when I was 2 years old. Yes, it has been the same, minus several appliance upgrades and new flooring, for 25 straight years. 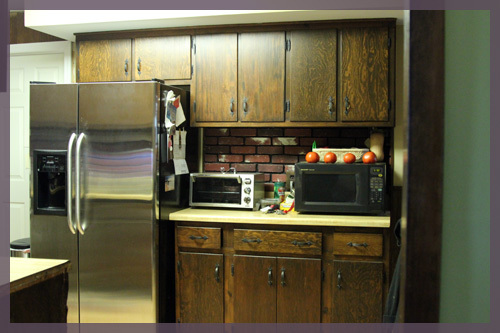 Yes old dark grainy cabinets, florescent lighting, faux brick backsplash, faux wood laminate countertops, a lack of storage space and cabinets that no longer stay closed. The 70s had a lot of style. When we moved in there was actually brown and orange peel and stick laminate flooring, which my parents upgraded to Pergo maybe 10 years ago? We also used to have a robin’s egg blue stove, brown dishwasher and a brown refrigerator. Those were the days. My mom had been telling me that they were looking at cabinets and having a contractor come to let them know if they could remove the soffits, which I thought was a great idea. 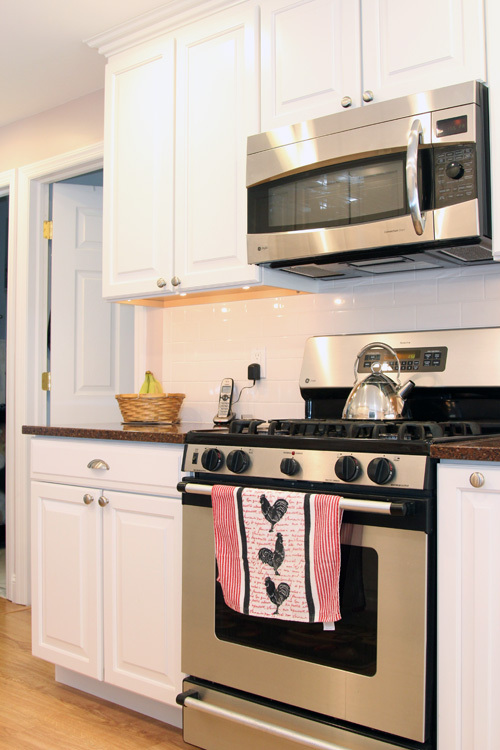 I recommended that they get rid of the hood and get a microwave with a vent built in, to save counterspace. We also talked about some pull out drawers for pots and pans, since their storage space now is nearly impossible to navigate. 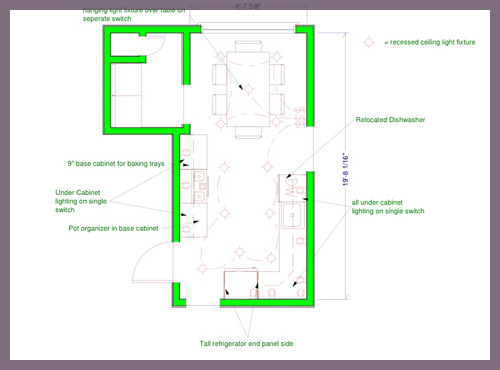 My dad works with a lot of contractors so I knew they had professional opinions weighing in, but I was completely floored when my mom sent me the plans for their new kitchen. Yes, they moved the fridge. Why didn’t I think of that? My mom had mentioned to the contractor that when she cooks (which she does often), she casts a shadow on the stovetop. So the guy moved it, making it look more open overall. 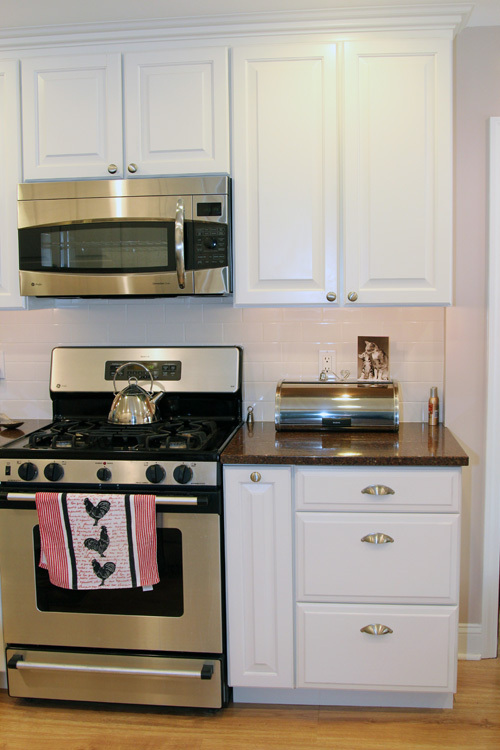 The dishwasher is also moved since it was always in the way of the stove and the corner cabinet. Another genius move. The new stove area, complete with overhead microwave. That door on the left is my old room 🙂 On the right is the laundry room, which they are also getting some cabinetry for. My camera battery died after literally 5 pictures, so I didn’t get a chance to get everything. As if all of the appliance moves and tile backsplash weren’t enough for me, I was also sent the electrical plan. It’s hard to see, but it’s full of recessed lighting and under cabinet lights! 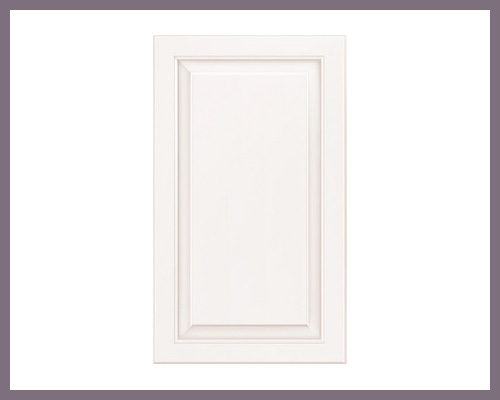 Last night my mom asked me to look at the cabinet website and help her pick one out, so I told her to go with a white linen (not a complete bright white) in a simple bevel. Look familar? 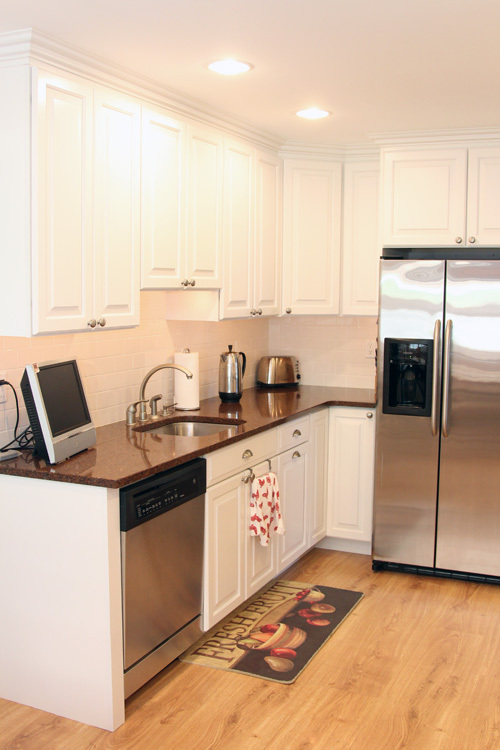 Yes it’s similar to ours, but my mom always admires our white cabinets and in a small kitchen with little natural light, I think white is the way to go. 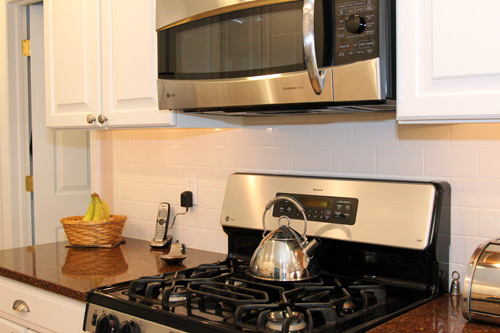 They still have to choose hardware and a tile for the back splash, but they still have some time for those extras. 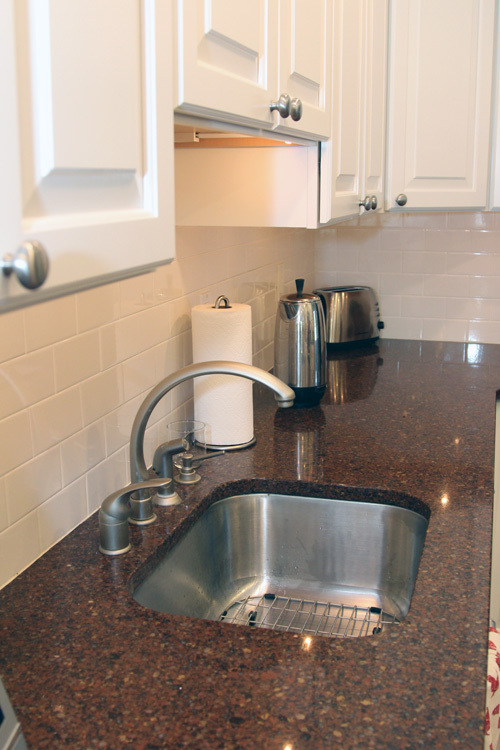 My mom mentioned doing a Silestone counter top, which I think is a great choice.